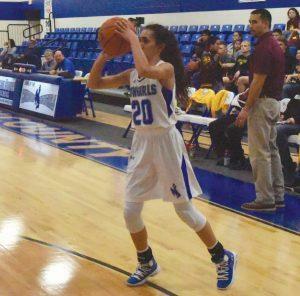 McMullen County’s girls basketball team beat Austwell-Tivoli 76-21 on Feb. 5 to finish the district part of its schedule unbeaten while earning their 20th straight win. McMullen County led 25-7 at the end of the first quarter and 49-11 at halftime. Caeli Taylor scored 28 points. The Cowgirls (26-3, 7-0 District 1A 32), which are ranked fifth by the Texas Girls Coaches Association, clinched its district title with a 50-20 win at Bruni on Feb. 1. They led 10-6 after the first quarter and 23-12 at halftime. Caeli Taylor scored 20 points, hitting four three-pointers. Chloe Taylor had 10 points and three steals. Caina Sneed had nine points and five steals. Brenda Beyer had seven points and four steals. The Cowgirls have scored at least 50 points and won by more than 20 in every game of the past month. McMullen County will play at home against Falls City at 5:30 p.m. on Feb. 8. As a district champion, the Cowgirls have a bye through the first round of the 1A playoffs and will start in the area round later next week.